Hodding Carter Jr., a bold newspaper editor and publisher, spent his career challenging the most powerful interests in two Deep South states. Before he was thirty, Carter founded a small tabloid, the Daily Courier, in his hometown of Hammond, Louisiana, and used it to assail the politics of Huey P. Long. Following Long’s assassination in 1935, a group of Mississippi Delta men recruited Carter to come to Greenville and establish the Delta Star to compete with an uninspiring local newspaper, the Daily Democrat-Times . Within two years, Carter bought out his rival and merged the two papers into the Delta Democrat-Times, which served as the base for his broadsides against reactionary politicians and the Citizens’ Council. Carter won a Pulitzer Prize in 1946 for editorial commentary that attacked the racist Sen. Theodore G. Bilbo of Mississippi and upbraided the US government for its treatment of Japanese Americans. His son, Hodding Carter III, wrote that the family “lived in a sporadic state of siege” during the long period when the elder Carter was a lonely white voice in opposition to Mississippi’s segregationist forces. He kept an arsenal of guns to defend himself and rallied members of his family to maintain an armed vigil at his Greenville home during the 1962 fight over the integration of the University of Mississippi. During the turbulent 1960s Carter began to break down both mentally and physically. Yet when he died in 1972, he was lionized for his fierce defense of the First Amendment, for his courage in confronting influential enemies, and for championing unpopular causes. Born in Hammond, Louisiana, on 3 February 1907, William Hodding Carter Jr. was a child prodigy who started school and was immediately placed in the fourth grade. He went on to graduate from Bowdoin College in Maine in 1927. He studied journalism at Columbia University for a year and then accepted a teaching opportunity at Tulane University, where he met his future wife, Betty Werlein, a member of a well-known New Orleans family. She acted as a valuable adviser and anchor to his newspaper operations for the rest of his life. They had three sons—Philip and Hodding III, who became prominent journalists, and Thomas, a Tulane student who died while playing Russian roulette in 1964. 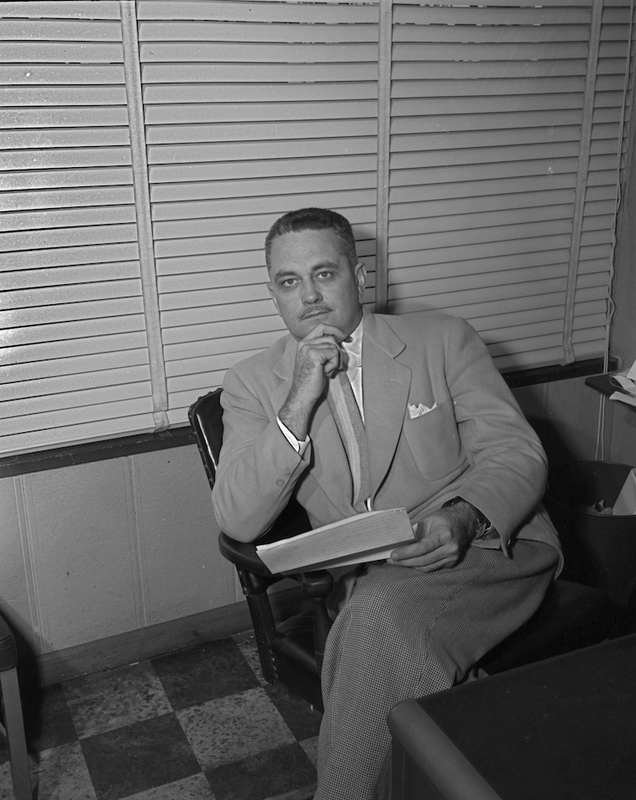 Carter worked briefly for the New Orleans Tribune and the United Press bureau in that city before moving with his young wife to Jackson, where he took a job with the Associated Press. Within five months he was fired for “insubordination,” an experience he cheerfully described in Where Main Street Meets the River, a 1952 memoir believed to be his favorite among the many books he wrote. He went back to Louisiana to take on Long, who had moved from the governor’s mansion to become a US senator. With a wide following at home, the man known as the Kingfish still dominated state government and represented a threat to Pres. Franklin D. Roosevelt’s reelection chances. Hailed by the national magazine Literary Digest as “one of the most articulate” Louisiana opponents of the Long machine, Carter found a wider audience with a 1934 New Republic article, “Kingfish to Crawfish.” Long retaliated by stripping the Daily Courier of advertising for the legal profession, a major source of revenue for Carter’s paper. Greenville writer David L. Cohn and planter-poet William Alexander Percy were among the men who lured Carter to the Delta. After quick success there, he received a Nieman Fellowship to Harvard in 1939 and worked for a summer at Ralph Ingersoll’s famous New York daily, PM, before returning to Greenville. But he left again when called to serve in the US Army during World War II. While in the service, he was partially blinded after he injured his right eye in a freak accident. Carter wrote prolifically and attracted a cadre of outstanding young journalists to work for him in Greenville. As the civil rights era intensified and his health declined, Betty Carter quietly maintained her role as a manager of the Greenville paper, and their son, Hodding III, came home to take over the effective editorial control of the Delta Democrat-Times while his father returned to the Tulane faculty. Harassed by political adversaries and afflicted by blindness, grief over his son’s death, and a deteriorating mind, Carter was compared in his final years to King Lear. The Delta Democrat-Times was sold five years after his death, but the Greenville newspaper left an indelible legacy in Mississippi. Article Title Hodding Carter, Jr.